When you’re planning to list your home, even in a fast market, think about first impressions and get everything tuned up. Walk across the street at take a look at your home with a critical eye, as if you didn’t live there. Any clutter to remove? Dead plants in pots or an unfinished project? Do you have a spot of colorful bulbs coming up in a pot? 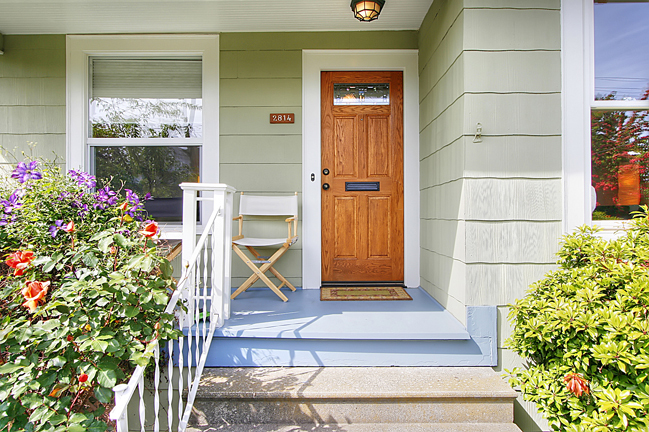 Is the front walk manicured and the porch inviting? Nothing makes a better impact than a good first impression, and it includes getting spider webs off the outdoor lights, a new door mat, freshly washed windows and a crisp presentation. I’ve found that buyers have three pivot points that make them want to buy a home or not: the first is how it looks on-line, the second is curb appeal as they come up to the front door, and finally how they feel during the first minute or two when they walk into a home. If those three points click, you’ve likely got an interested buyer. When those impressions are great on-line but not so good in person, the end result can be that the buyers are lukewarm, are concerned there may be maintenance issues, and often pass on the home, waiting for the “right one” to hit the market. Even in this fast paced real estate market, there is nothing as powerful as being ultra popular with buyers. I’ve got more ideas about making your home shine when it hits the market so feel free to touch bases with me if you’d like more information. My feeling is when it is priced right and well presented, you’re likely to get more agents showing your home, and more buyers bidding on it. Details, details, details . . . they really pay off!